The Eastern Trail Management District (ETMD) is a group of representatives from each Eastern Trail town that manages the construction and upkeep of the trail. The Eastern Trail (ET) in Maine is currently a 65 +- mile signed bike route that starts at the Piscataqua River in Kittery and ends in South Portland, Maine, crossing the communities of Kittery, Eliot, South Berwick, Wells, Kennebunk, Arundel, Biddeford, Saco, Old Orchard Beach, Scarborough, and South Portland. 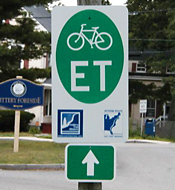 The ET is part of the East Coast Greenway bicycle trail that extends from Maine to Florida. The ET in Maine is both on-road and off-road, and some off-road portions of the trail are under construction and others have not been built. The ETMD is a non-profit corporation created in 2001. A Board of Directors governs an Eastern Trail partnership between the Eastern Trail Alliance and the ETMD. The ETMD is comprised of one representative from each of the participating municipal members and three representatives from the Eastern Trail Alliance. The Eastern Trail Management District Membership Agreement authorized the incorporation of the ETMD. The agreement is the mechanism that brings the participating municipalities along the trail route and the non-profit Eastern Trail Alliance into the ETMD. This innovative agreement is the first of its type in both scale and objective; it combines municipal effort and non-profit agency support to build and maintain the trail system. The goal of the ETMD is to establish a four-season, multipurpose, transportation and recreation trail between Portsmouth, New Hampshire and South Portland, Maine that provides a connection between areas of historical and natural significance, existing local trail systems, the beach areas and inland plains and municipalities both on and near the trail. Eastern Trail Route SignClick here for information about ETMD meetings in 2019. © Copyright 2019, 2013-2018 Eastern Trail Management District. All rights reserved.